Amphicar for Sale; Engines and Transmissions; New & Used Parts; Accessories; Amphicar Trailers; and trailers for all cars, trucks, tractors and motorcycles. Any size, both open and enclosed, steel or aluminum! Also complete restoration, repair and maintenance service. The Amphicar was built in Germany by the IWKA Corporation from '61 to '68. Total production was approximately 4,000 vehicles. Hans Trippel, the genius that invented the car, had years of experience designing amphibious military vehicles. The Amphicar is the only civilian amphibious passenger vehicle ever mass-produced. It is often called a boat car, water car, duck, amphibious vehicle, or the boatcar. However, it is correctly called an "Amphicar". The Amphicar has a top speed of 7 mph in the water and 70 mph on the road. Hence, it was dubbed the "Model 770". Fuel consumption is 32 miles per gallon on the road, and 1 1/2 gallons per hour in the water. The curb weight is only 2260 pounds, but it can carry close to 700 lbs. The "land transmission" is a 4-speed w/reverse. The "water transmission" features forward and reverse gears, driving the "twin screws". The single 43 HP Triumph engine, located over the rear-wheel drive tires, powers the car on the road and in the water. Rear engine traction means "Go" in the mud and snow. In the water the front wheels are the rudders. Due to the popularity of Amphicars, most parts are available. The performance of the Amphicar is incredible! It is ultra safe in the water, deemed unsinkable with the top up (sealed like a sailboat), rivals other boats with its stability, and handles rough water well. Although it was given a "bad rap" by most automotive journalists, it maneuvers fantastically in the water, is fast enough to pull a very light water skier, and even has brakes in the water (by selecting reverse and applying full throttle). People agree that it has an incredibly nice ride on the road, and feels like a modern car! The acceleration is not Ferrari-like, but who cares? When someone brags to an Amphicar owner about his or her collector car, a good response is; "Does it float?" Madonna owns one. She and her friends love to describe the feeling of driving into the water for that first time! Actually, the concept of the "car that swims" is quite simple. Just take a boat and bolt on suspension. Five penetrations in the hull are all that's needed; two for the props, one for each rear wheel drive shaft, and one for the steering shaft. Not difficult to seal. People are always amazed that the door seals keep out water. They are as simple as refrigerator door seals. With the Amphicar doors closed and locked properly, no water will get in the vehicle. Being the captain of an Amphicar is like being Johnny Carson: everyone loves you, they're all smiling, and they all want to shake your hand. However, when you want all the attention to end, you just simply walk away from the car. Johnny couldn't do that! When new, the Amphicar sold for between $2,800 and $3,300. The Amphicar was a phenomenal vehicle, way ahead of its time. However, thanks to the many new US regulations and poor sales, the factory in Berlin closed for good in 1968. 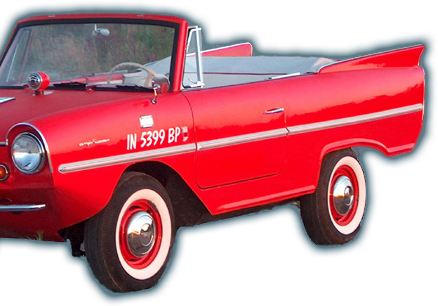 The Amphicar had many uses, and was even purchased by numerous fire departments as a rescue vehicle. The manufacturer even offered an optional stretcher that was mounted to the rear of the car. But in one enthusiast's opinion, the Amphicar is only good for one thing: FUN!